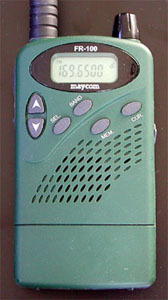 The Maycom FR-100 is usually marketed as an 'airband scanner'. In spite of that, it covers 66-470MHz in AM, FM-wide and FM-narrow, so this scanner is suited to be modified to monitor paging networks. There is not much space to mount an additional chassis plug for the discriminator output. I have modified the headphone plug to connect the discriminator signal, keeping the headphone signal available as well. Remove the washer from the volume potentiometer with a pair of fine tip pliers. 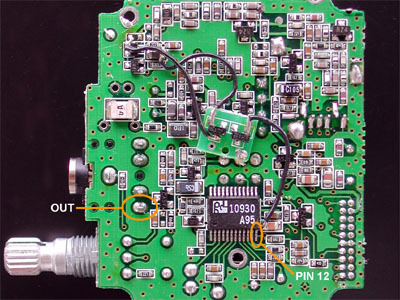 Remove the solder of the antenna plug's ground and inner conductor. Use desoldering braid or a desoldering pump. 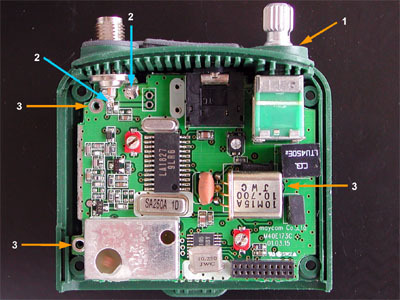 Remove the three screws that connect the board to the housing. The right screw is partly hidden under the 10.7 MHz XTAL filter. The discriminator IC, a 10930, is a VSOP (Very Small Outline Package) IC. Its pins are spaced 0,5 mm (0.02''). A 'normal' SMD in SOIC (Small Outline IC), like the MC3361, uses a spacing of 1,27 mm (0.05''). The discriminator signal can be found at pin 12, on a corner of the IC. The scanner uses a stereo 3.5 mm headphone output. The middle contact is used for the discriminator output. 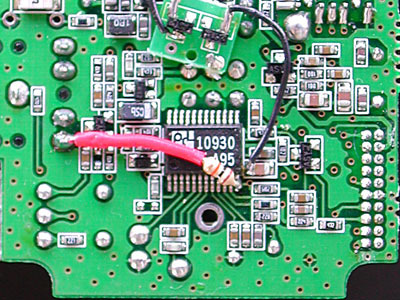 The solder pad indicated above is connected to this contact. A 10 k resistor is soldered to pin 12 of the receiver IC. Its other lead is isolated and connected to the chassis plug solder contact.